Advertisements for the big guys at the end of the tournament. Sumo wrestling is Japans most famous long standing traditional sport. Two 300-350 pound men with giant wedgies make their way onto the floor of the dohyō (sumo ring) made of clay mixed with sand as one pounces on the other and the loser falls flat onto an onlooker. This was what took place at the very first match I saw an the Summer Grand Sumo Tournament on day 14 at sumo stadium in Rygoku, Tokyo. Why would they put the audience members and judges so close to the ring? In my personal opinion, it's all for affect, the crows goes wild when one of the audience members gets flattened by a giant sumo and it is by far one of the funniest things I have ever witnessed in my life! According to Japan Guide, there are no weight restrictions or classes in sumo, meaning that wrestlers can easily find themselves matched off against someone many times their size. This was often the case in the matches I saw where one man was easily 70 pounds heavier than the other. There are about 6 sumo tournaments per year in Japan each lasting 15 days and 3 of which are held in Tokyo. If you happen to be in Japan during one of these tournaments purchasing the cheapest ticket up in the nose bleed section for 3,600 yen about $35 USD will be the best money you ever spend during your time in Japan. Attending a sumo tournament can be an all day event. The doors opened at 9 am and the last fight was at 6pm. In the morning the amateurs compete and then later into the afternoon the pros start coming out and the stadium gets packed. I was lucky to see a geisha sitting up in the front rows of the ring dressed beautifully in a robe with her white face and perfect posture. You may also see the sumo wrestlers enter and exit the stadium from the front entrance. Before and after the tournament you will see groups of sumo wrestlers getting in and out of taxis and even hopping on their bikes. When I arrived at the stadium I saw one of the lower ranking sumo professionals getting on the subway, and another hopping on his bike! A good think to know about attending the tournament is that you can bring any of your own food and drinks inside the stadium. Yes, this means you can buy a case of beer and bring it into the stadium so that you don't pay $5 for a small and $7 for a large Asahi. I learned this the hard way when I saw fellow audience members busting out their sushi and drinks brought from home. However, I did equate the Japanese sumo match to a good old fashioned base ball game and went and bought a hot dog $3 and a large beer! You can exit the stadium once and re-enter, so you can also go out to get lunch or leave for a while and come back. One of my co workers was smart enough to find out about a radio rental for $1 that translates the Japanese radio televised version of the tournament into English. This was very helpful for knowing who was up against each other and what their past rankings were. Some of the sumo wrestlers were foreigners from Brazil and Mongolia and there was even one white guy who defeated a Japanese wrestler. Professional sumo is only practiced in Japan, and Wikipedia notes that there are currently 55 wrestlers listed as foreigners. So when you see a foreigner they really stand out, and the Japanese crowd goes wild. As the tournament goes on the fans become more and more enthusiastic and men with flags enter the ring. At first I thought the flags were just for show based on the wrestlers ranking, but then I learned afterwards that the flags are actually sponsorships. The entire experience was one of excitement and awe. The actual wrestling matches happen so quickly that if you turn to talk to your neighbor it will be over by the time you turn back. Everything happens so fast, so keep your eye on the ring, and you wont miss a thing. For those of you that are near sighted, I know this may sound silly, but I strongly recommend for you to not forget your glasses on the day of the sumo match. I forgot mine, and found myself watching most of it through the zoom on my camera! There is nothing better than getting an up close glimpse of those wrinkly and hairy chests and jiggling butts as the sumo wrestlers literally slap their own butts. Sumo poses outside of Rygoku. A full house for the final sumo matches with the big shots. Another big match, you can see the stadium filled up to the max. Views from the top of the sumo stadium in Tokyo really give you a good panorama. More sumo poses outside Rygoku. This sumo is signing autographs after the tournament. 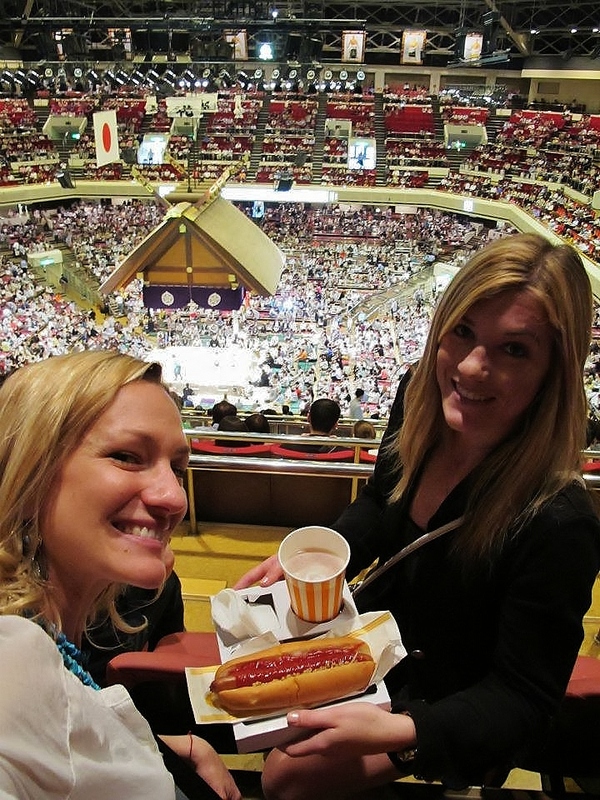 There's nothing like a hot dog and a beer at a sumo match in Tokyo! Sumo wrestlers exiting a taxi cab at Rygoku stadium and entering. Flags that line the outside of Rygoku. One of the entrances into the stadium. There are many shops lining the entrance with souvenirs. A sumo wrestling vending machine. Nicki and I posing with some real life sumo wrestlers at Rygoku stadium! Bright lights inside Rogoku stadium. Pictures of sumo champions that line the stadium walls.